INSECT UPDATE (7/19/18): Bermudagrass Stem Maggot and Fall Army Worms have been spotted at treatable levels in many areas South of I – 20. Producers in and around this area need to stay vigilant! Producers who are cutting hay in these areas should consider implementing the BSM suppression technique 7-10 days after cutting. Producers just above this area should be scouting for damage and implementing the suppression protocol accordingly. For more information on managing and mitigating bermudagrass stem maggots, click here. For information on insecticide recommendations for BSM, click here. Producers also need to keep an eye out for Fall Army Worms. An infestation can seem to occur almost overnight so it is very important to scout and scout often! The use of pyrethroid insecticides to knock down populations might be the most economical option in a hayfield that is nearing harvest. For information insecticide recommendations for FAW, click here. 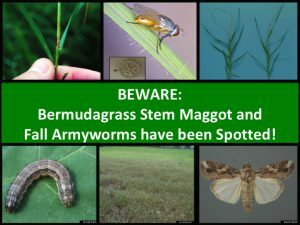 Posted in bermudagrass stem maggot, fall armyworm, Grazing, Hay, insects, News. Bookmark the permalink. Previous: Is your stocking rate correct?